To see part 1 of my 48 hour guide, click here. And welcome to Day 2! In the morning, head downtown into the heart of the city. Downtown Crossing and the surrounding area are known for shops, ranging from H&M to Coach on posh Newbury Street. Tucked away between tall buildings is Ogawa Coffee. Ogawa began in Kyoto and became widely recognized as one of the best coffee shops in Japan, with over 36 locations. 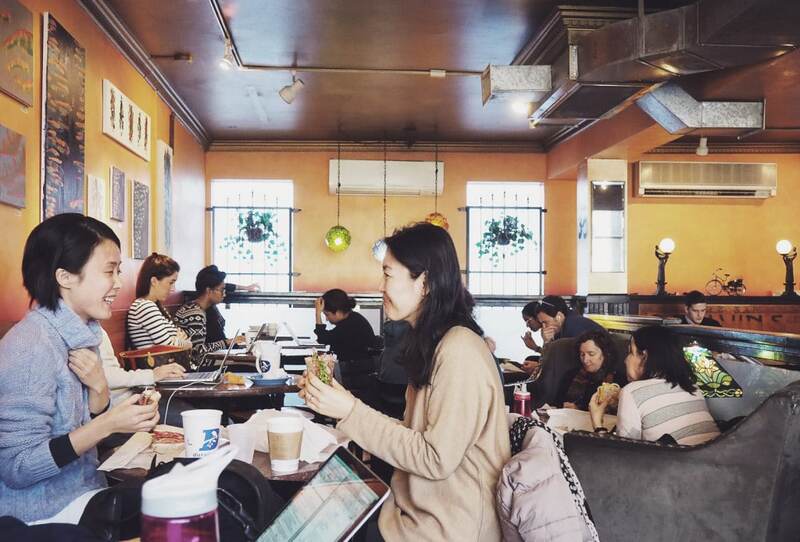 They recently made the journey to the USA, creating their first international coffee shop in Boston. 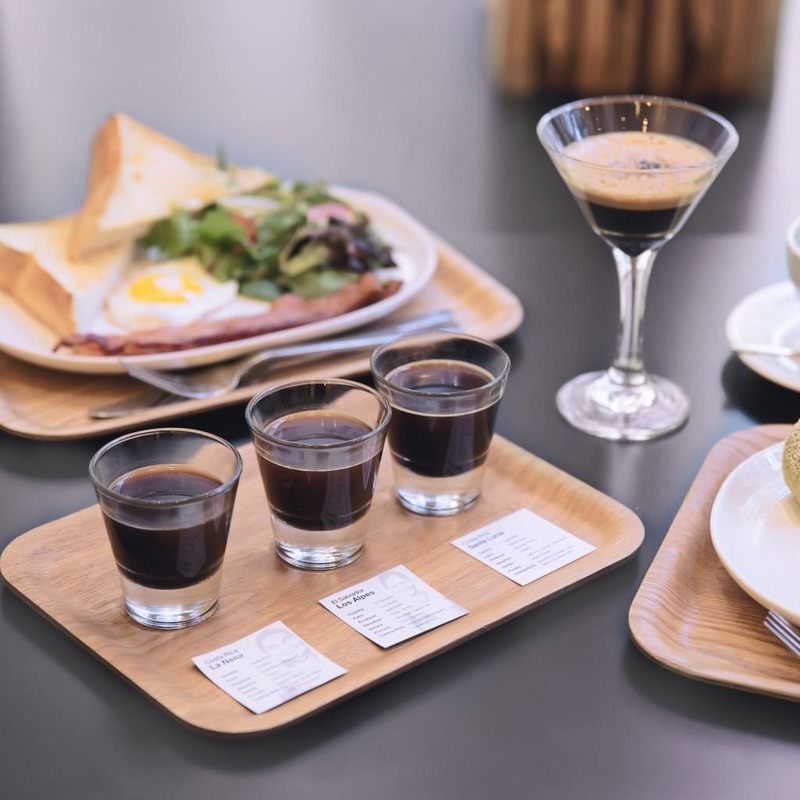 Ogawa blends Eastern fastidiousness with a familiar product– the coffee bean. 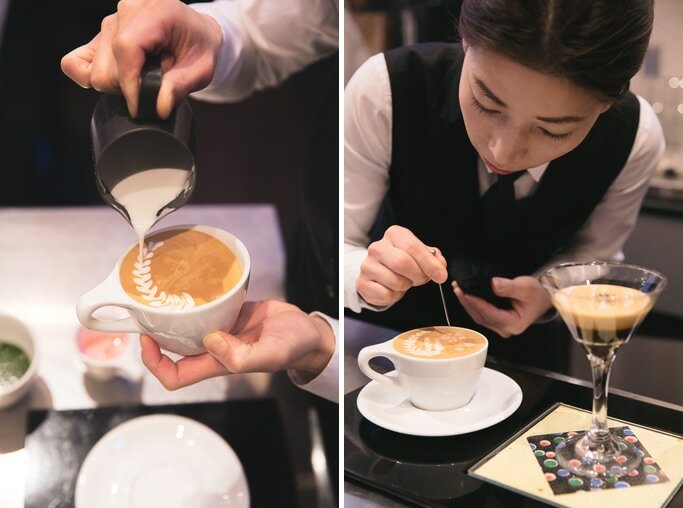 Their head barista, Haruna Murayama, is the 2010 World Latte Art Champion. So yes, if you go here your coffee will be seriously Instagram-able. Be sure to try their Signature Drink, a duet of chilled, foam espresso and a cappuccino. Served together, these two drinks compliment each other, and were a welcome start to the morning. Part of what makes Boston so special is Cambridge, located on the adjacent side of the Charles River. The Red Line makes it an easy trip– you can go from downtown Boston to Harvard Square- the heart of Cambridge and Harvard University- in 20 minutes via public transportation. 10 if you take a car. Harvard Square is home to a plethora of clothing stores, eateries, bars, and specialty shops. You could really spend an entire afternoon exploring the area. Be sure not to miss the Harvard Museum of Natural History, Cardullo’s, and Black Ink. 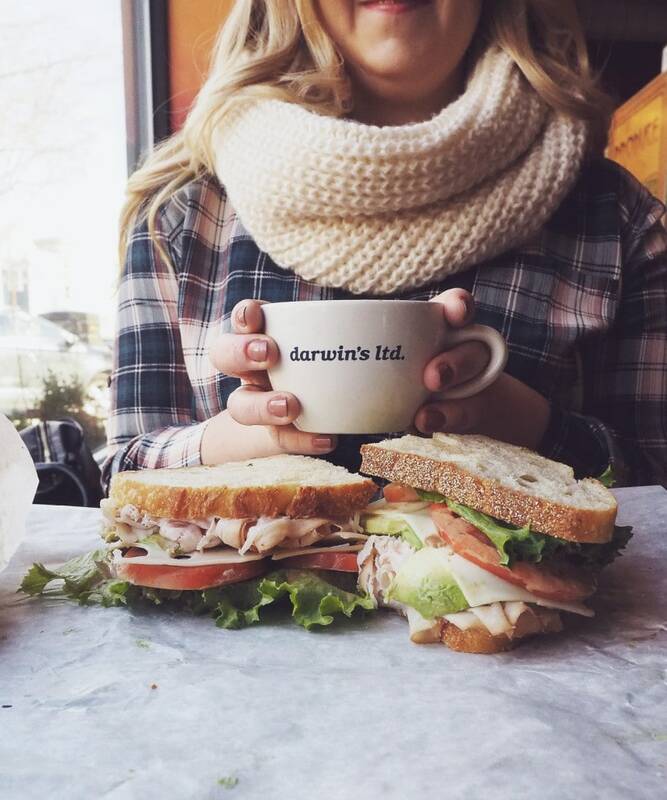 Between activities, be sure to grab lunch at Darwin’s Ltd, perhaps the most well-known sandwich shop in Cambridge. 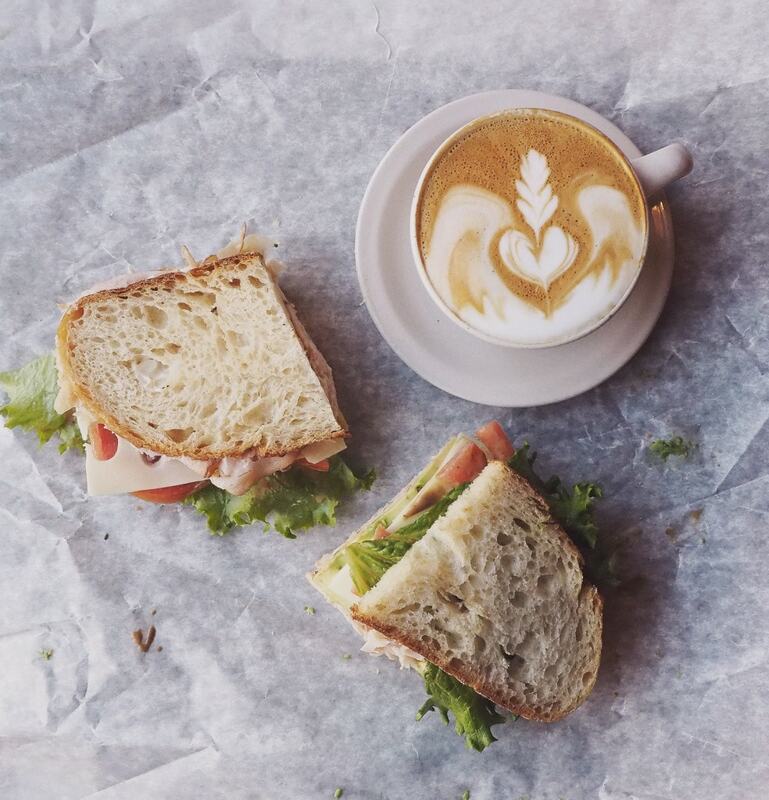 Darwin’s calls itself “purveyors of sumptuous comestibles & caffeinated provisions.” The menu caters to Harvard Business School lunches and local high schoolers alike. 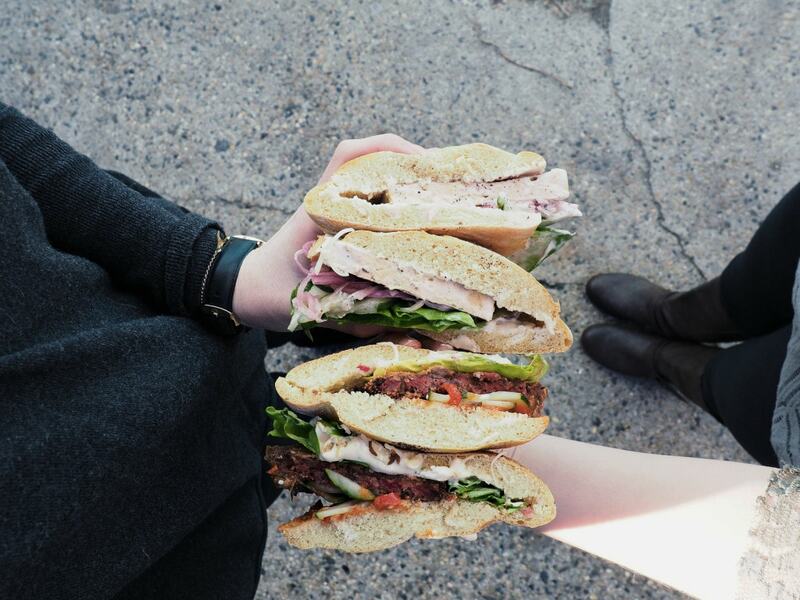 Each sandwich is handmade to order from a line that quite frequently goes out the door. 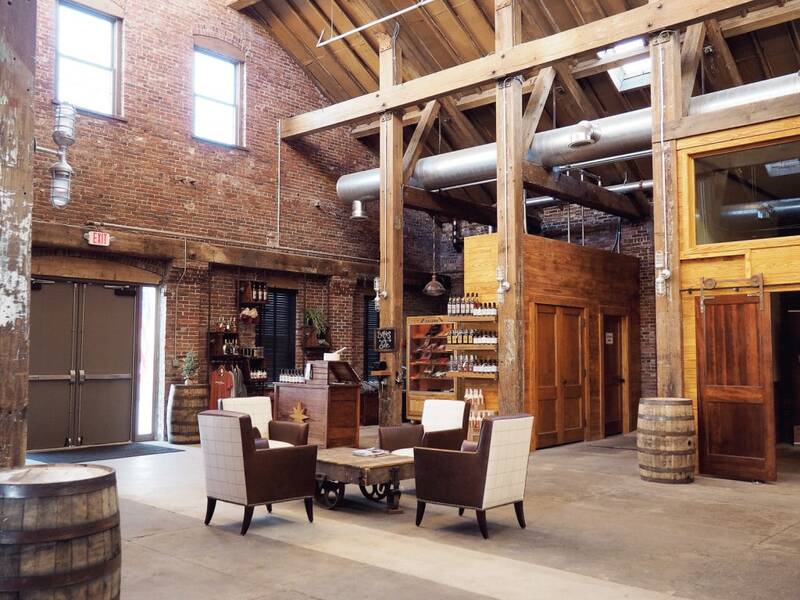 After a filling lunch, take yourselves to Boston Harbor Distillery for an afternoon tour. I can almost guarantee that this is going to be the best part of your trip for so many reasons. 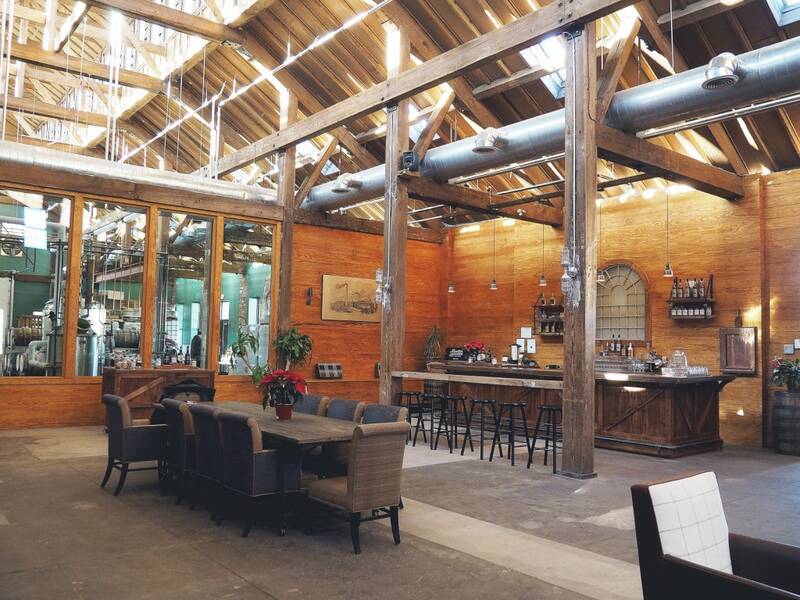 Tours are every Saturday from 1-7pm, and include tastes of housemade spirits and a tour of the distillery. All for $10. Seriously. 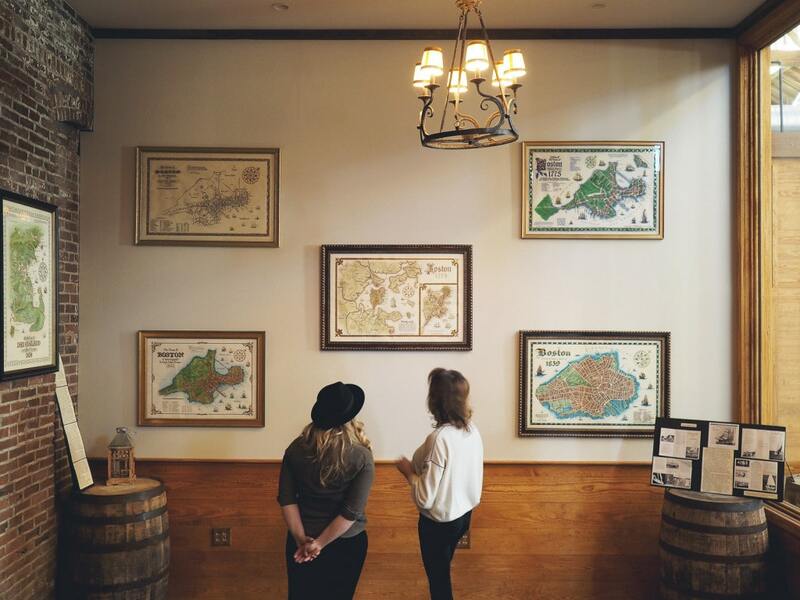 One of the most remarkable things about the distillery is how it is deeply rooted in the building’s past. Throughout the years the building went through multiple owners, beginning as a horseshoe nail factory in 1859, becoming a ship building factory (as seen today by the tall spine of the roof which presumably made room for ship masts), to an ice cream production facility. 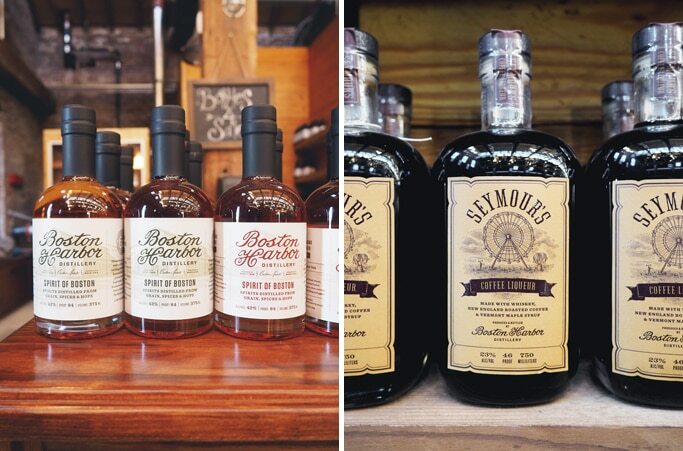 Each bottle of liquor made by Boston Harbor Distillery pays homage to these artisans. They have Lawley’s New England Spirit, Putnam New England Rye Whiskey, and Seymour’s Coffee Liqueur, among others. The entire building is gorgeous, filled with light and old wood beams. As soon as you open the door to the bottling room, the sweet scent of whiskey lingers in the air. We watched staff bottle Lawley’s by hand, then got to taste all the spirits. I couldn’t leave with just one, so I got a bottle of whiskey that had been distilled in Sam Adam’s casks and Seymour’s Boston Cream Liqueur, a blend of cream, Vermont maple syrup, and rum. Swooon! Sidenote: you can bet I have a Boston Cream Brownie recipe coming to the site next week. The owner, Rhonda Khallman, was an absolute treat to talk with. She co-founded Sam Adams, established New Century Brewing Co., and most recently launched Boston Harbor Distillery. She was a wealth of knowledge, but also approachable and funny and just a total boss lady. She made our tour of the distillery a more than memorable one. So clearly I can’t stop talking about this place. I loved it so much and have the utmost respect for everything they are doing. If you make it to Boston, put this on your list. You won’t regret it. 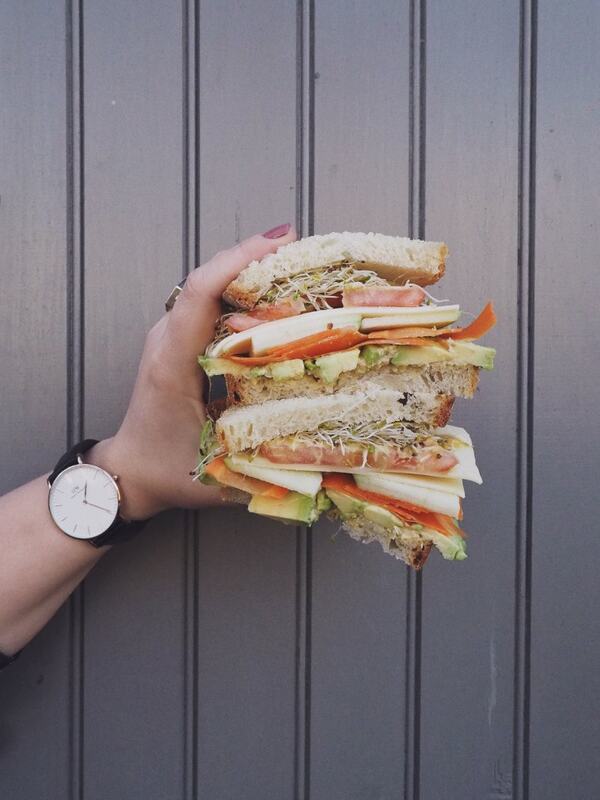 Can you tell I have a huge thing for sandwiches? Yep. I love them. 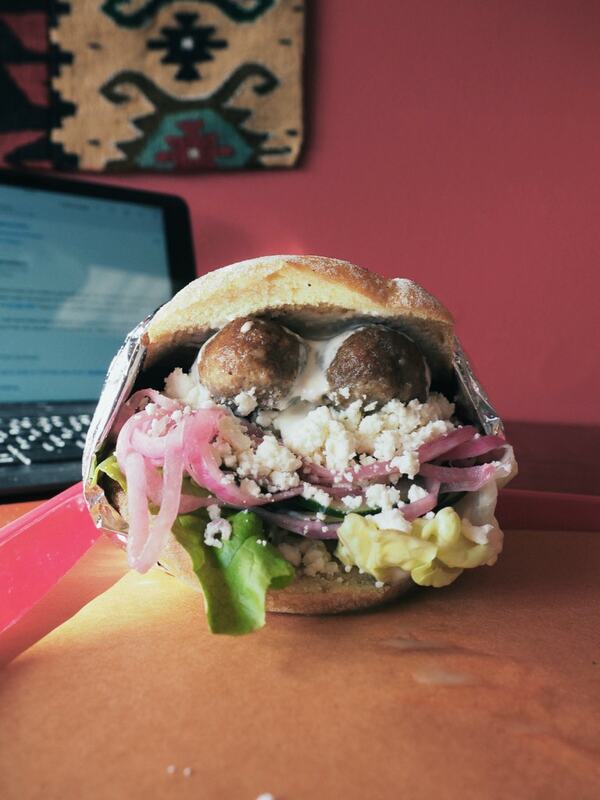 I just had to include a stop at Playska, a Balcan sandwich shop in Inman Square. Playska is a hole in the wall. If you didn’t know it, you’d probably walk right by it every day not knowing that it’s there. But behind the door there lies an absolutely incredible lunch spot. The sandwiches are bursting with flavors and fresh ingredients, like the Veggie Playska: a beet, lentil, and walnut patty on lepinje bread, with ajvar relish, cucumber pickle, and a cream cheese rémoulade. 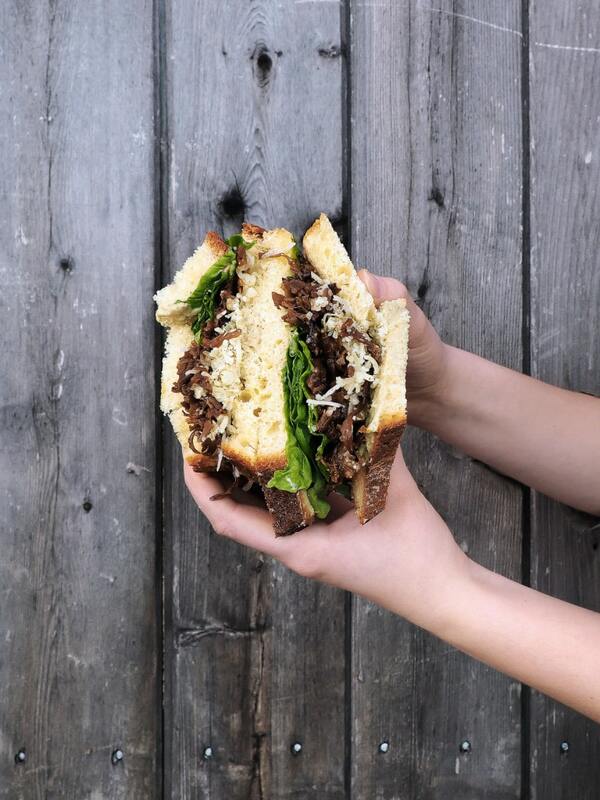 Or the Foraged Mushroom with hand-picked hen-of-the-woods, avocado and red cardamom spread, butter lettuce, and aged cheddar on challah. The shop itself is very no muss no fuss. The sandwiches are the stars. I wish there was a location closer to me because I would go here every day. 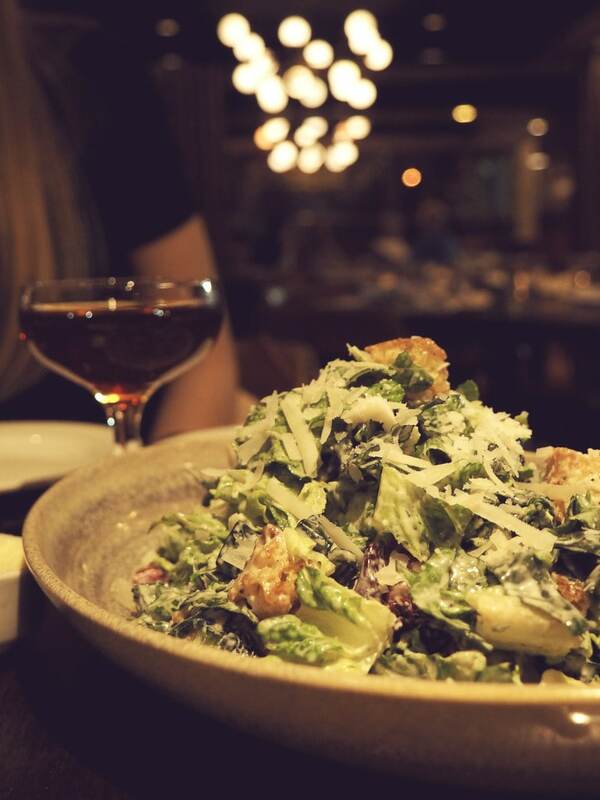 The mixture of daily menu changes and inspired flavors makes for a spot you want to revisit again and again. 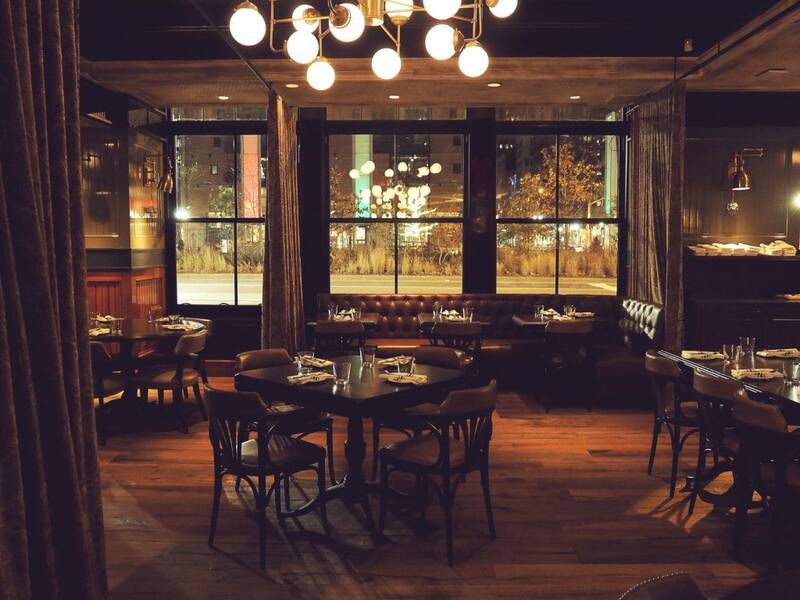 After a little walking around the South End or Back Bay, may I suggest heading to the Seaport district for dinner at State Street Provisions? It’s the perfect way to close out the day. The atmosphere at State St. Provisions is warm and welcoming. 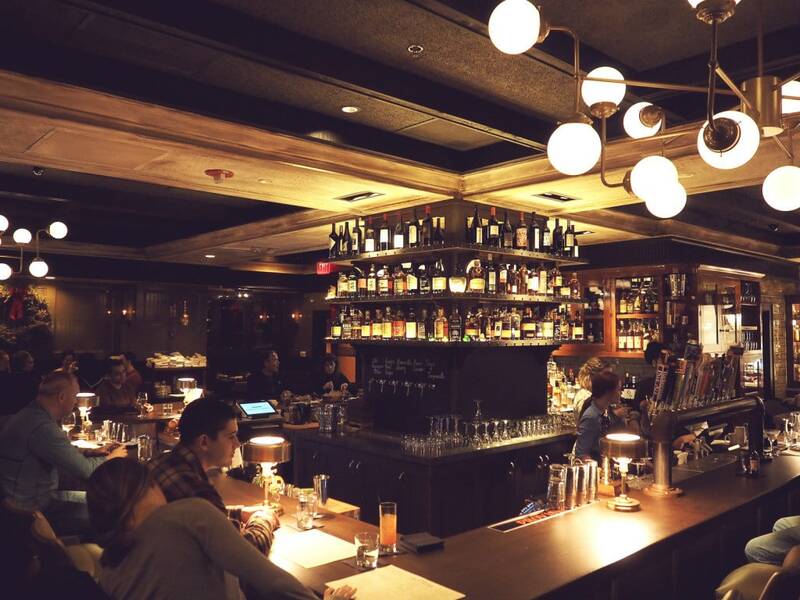 From the tufted leather booths to the well-stocked bar, it makes you feel like you’re really in Boston. We absolutely loved the Kale Caesar Salad, the Housemade Rigatoni with beef cheek and poached egg (drool), and the Salt Cod Fritters. Because you have to have cod at some point when you’re in Boston, and it had better be fried. Again I found the people there to be incredibly gracious, friendly, and attentive. It’s something I remarked on throughout my trip; everyone was so nice. Bostonians get a bad rap, but what I found was a group of welcoming, warm people that clearly care deeply about what they do. Food with integrity. That’s it. I mean, I had to wrap up the trip with an extra breakfast thrown in, because LOOK AT THIS FRENCH TOAST. 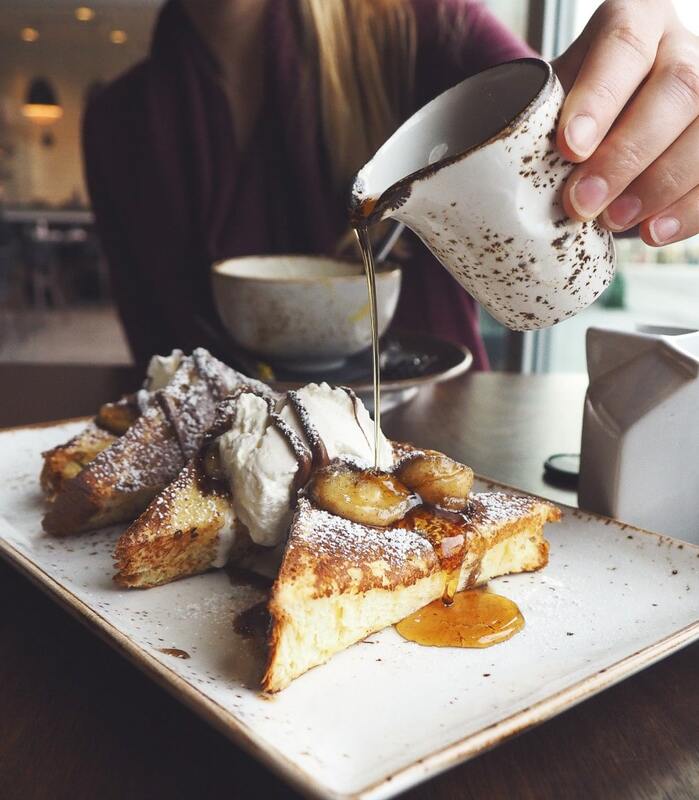 Nutella French Toast with brown sugar caramelized chai rum bananas, to be exact. Outlook, the Envoy’s main floor restaurant, was almost as beautiful at night as it was during the day. 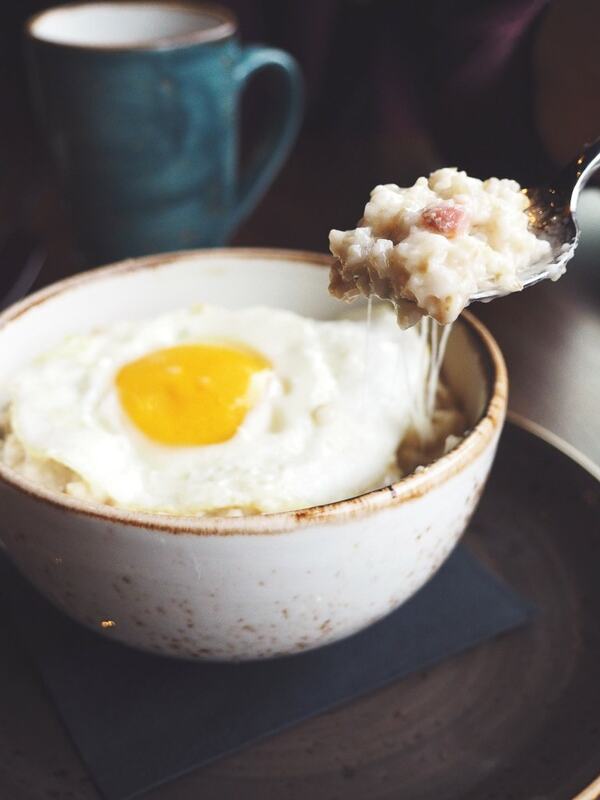 Even though we were stuffed from the night before, we couldn’t resist the Savory Oatmeal with ham, shallots, swiss cheese, and an egg on top. Talk about my kind of breakfast. Overall, it was an amazing trip. Even as a native Bostonian, I was introduced to places that I hadn’t explored before, and fell in love with this city all over again. 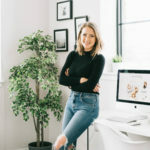 My top travel tips for Boston? -Rent a car or Uber everywhere. As any survivors of Snowpacalvpse 2015 can attest to, public transportation in Boston is in need of some serious modernization.Plus, it goes out like a star, so that it’s hard to go from one location outside of the city to another without having to go through the center. -Spend a whole day in Cambridge. It’s so full of things to see and do, and is one of my favorite parts of Boston. -Come during the spring or fall. Boston is chilly in the winter and hot in the summer, so catching either the warm spring air or the insane fall foliage is a must. -No matter what you’ve heard, do not ask locals if they pahked the cah in Hahvahd Yahd. First of all, Harvard Yard is a park. Secondly, party foul. My husband and I are going to be planning a trip to Boston at some point in the future to go to the baseball stadium there, thanks for all of the great tips on places to eat!! We will DEFINITELY be going to the distillery, that sounds awesome and looks like such a neat stop! You absolutely HAVE to. Tell them I say hi when you do!!! Aww, thank you Emily!! I’m so with you. Total no no. Glad I could make you love the city again!! 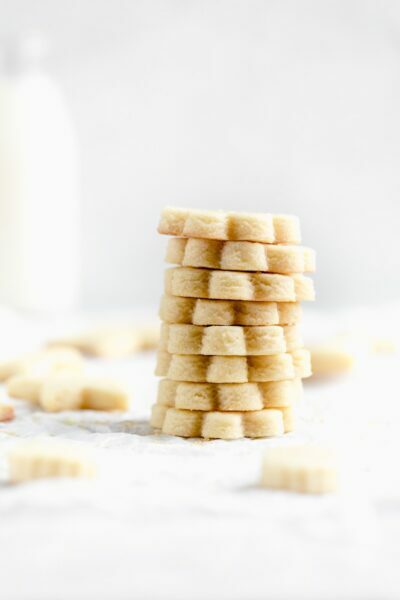 Loving these posts, Sarah! 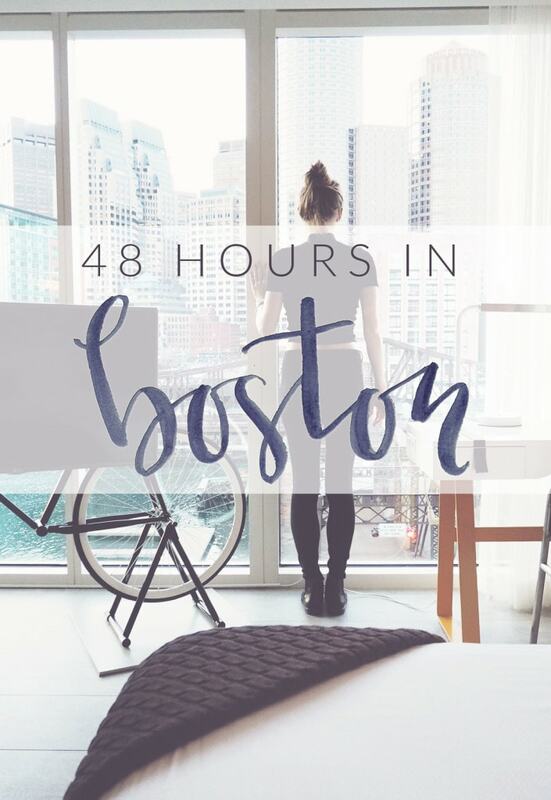 Boston is definitely on my “to visit” list (especially since it’s driveable!). Maybe this summer. When I get there, I’ll have your lists of spots on hand, for sure. Outlook sounds AMAZING! That savory oatmeal and insane french toast?!?! 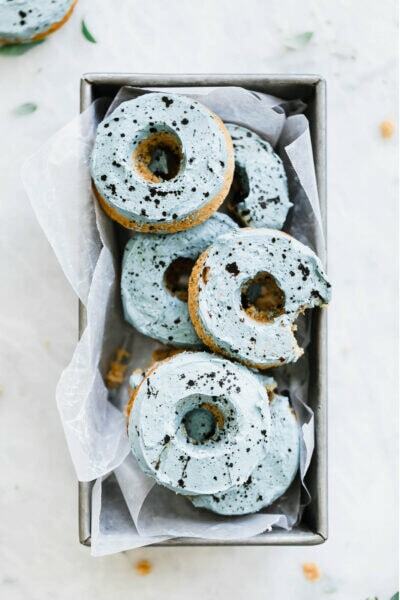 Definitely a must-try. It was so, so good. Thank you my dear! 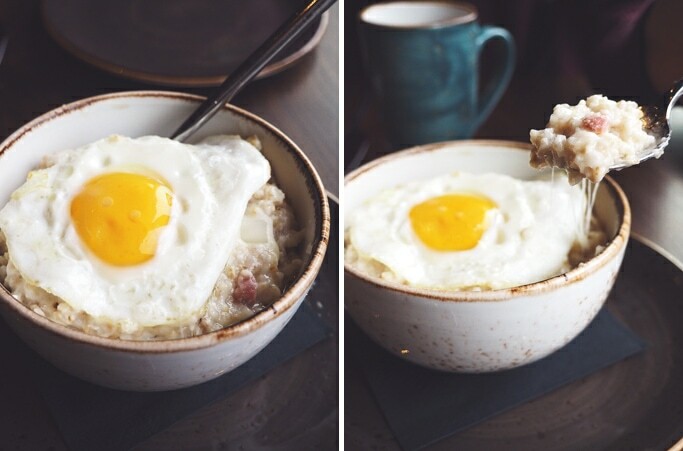 That savory oatmeal looks incredible. Seriously, let me climb in! Also, that french toast and matcha tea = delightful. I need to come to Boston so we can just eat food. No, seriously… can we do that?